Today's post, written by Meg Korpi and Rusty Wright, is a review of the movie Courageous. Sherwood Pictures presents films with a message, and their message always has the goal of making us better people. Do your best to see it if it comes to a theatre near you. Courageous begins as a fast-paced police drama with plenty of heart-pounding action, and a spine-tingling surprise within the first three minutes. Good-natured banter and comic mishaps had us laughing, but the movie quickly reveals an introspective side that portends more than levity and brave guys in uniforms chasing bad guys in do-rags. Indeed, Courageous tells a grounded, human story that focuses on the crucial role of fathers. It intertwines action, humor, pathos, male bonding, a couple of insightful women, and five complex main characters to portray ordinary men evolving into modern-day heroes who find the call to valor in their everyday lives. As peace officers commissioned “to serve and protect,” the protagonists are accustomed to facing danger. But when personal tragedy strikes, officer Adam Mitchell responds with a different kind of courage. Rather than bemoaning his fate, he exhibits the mettle to examine his adequacy as a father, confront his flaws, talk about them, and commit to change. Most would probably say he’s a “good enough” father (he provides for his family and does all society expects), but Adam adopts a higher standard. He resolves to be involved in his son’s life and make an enduring positive impact. Determined to follow through, Adam formalizes his decision with a written Resolution. Then he has the guts to ask other men to hold him accountable. This is not your typical Hollywood hero. Adam’s experience prompts his friends to join in adopting the Resolution. When life inevitably confronts them with difficult moral choices, they weigh their options and tempting advice like, “maybe it’s not wrong; maybe it just looks that way.” In retrospect, it turns out their apparent moral dilemmas weren’t dilemmas at all, just decisions that required courage. Courageous is the third cinematic release from Sherwood Pictures, the successful moviemaking arm of Sherwood Church in Albany, Georgia. Previous releases (also marketed by Sony-Provident Films) include Facing the Giants (2006) and Fireproof, 2008’s top-grossing independent film. 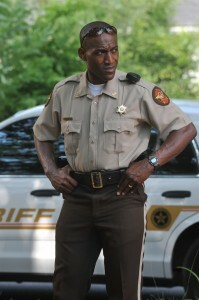 Nathan Hayes (Ken Bevel) suffers scars from his missing father. Courageous challenges viewers to examine their lives, and offers fodder for discussing values, parenting, self-improvement, responsibility to one another, etc. But the filmmakers go further by providing online resources to help motivated moviegoers pursue the film’s themes in their own lives. While it provides humorous and engaging entertainment, ultimately Courageous should be judged for its greater purpose—as a vehicle for long-lasting positive impact on society. Time will tell. Meg Korpi studies character development and ethical decision-making through the Character Research Institute in Northern California. She holds a PhD from, and formerly taught at, Stanford University. I can only imagine the anguish that this family is going through. They have a grueling and emotionally draining task ahead of them as they search for their parents. Joshua also faced daunting challenges. In Joshua 1:9, he had just become the leader of the Israelites. It was his task to take them across the Jordan River and into the land that God had promised them. Like the Chretien family, Joshua did not choose this role; he was chosen by God to complete it. God had been preparing Him for it, and God would enable him to do it. Joshua’s requirement was to obey the laws of Moses, to meditate on the word of God, and to be strong and courageous. Three times in Joshua 1:6-9, Joshua is told to be strong and brave, but it is not in his own strength that Joshua was to do this. By obeying the law of Moses, therefore being right with God, and by meditating on God’s word, therefore remembering His commands and promises, Joshua would draw his strength from God. Success would not depend on Joshua’s abilities, but on his obedience. God would keep His promise to Joshua and the Israelites, but they had to do their part too. The fulfillment of God’s promise to the Israelites took a lot longer than they would have liked. In today’s society, we have become accustomed to instantaneous results, and we become frustrated when things happen slowly. God sees things from a different perspective, and His timing is often much slower than we would prefer. He has never promised to give us immediate results, and if we had them, we would surely risk believing that we had succeeded in our own strength and be vulnerable to pride. When the challenges we face are harder than we can imagine, such that we need to be repeatedly reminded to be strong and brave in order to face them, we will know that any positive results we achieve are because of God’s goodness. May all the glory go to Him. Al and Rita Chretien are parents, grandparents, business owners and much loved members of their community. They were last seen on March 19, 2011 in Baker City, Oregon on their way to Las Vegas. They were driving a brown 2000 Chevrolet Astro mini van with British Columbia plate number 212 CAV. If you have any information about this couple, please contact your local police department and cite Penticton RCMP case file 2011-3395. And please keep this family in your prayers. On September 29, 2012, Albert Chretien's body was found by elk hunters, 11 kilometres from where the van had been stranded. He had been going in the right direction to find help, but the terrain was steep and wooded, and the snow was up to ten feet deep at the time. His body was found intact with identification still in his pocket.